Troiano Vegas Law is the website of Michael Troiano, a born and raised Las Vegas Criminal Defense Attorney. Mike practices exclusively in the area of criminal defense, and represents clients in a wide variety of criminal matters, including those charged with misdemeanors, gross-misdemeanors and felonies. Mike also places special emphasis on Driving Under the Influence “DUI” defense, and has personally defended over 800 DUI cases ranging from DUI 1st Misdemeanor to the more serious DUI with Substantial Bodily Harm and DUI with Death. 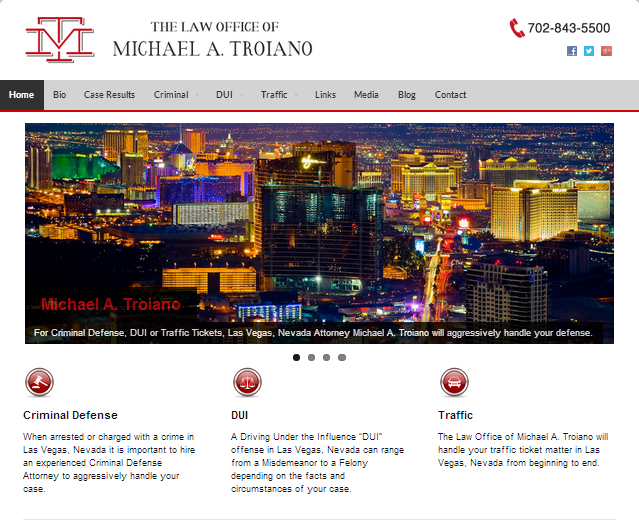 Quadshot customized a WordPress Theme for The Law Office of Michael Troiano website.